I know it's been a while coming but Birkdale Raceway is getting closer. A tad over 102 feet with a bit of a retro flavour and another variation on a paperclip. Just assembled this last night, not sitting right just yet. Nice Gary, whats the lane spacing? 100mm lane spacing, 125mm outside lanes to fence. Same as the Hornsby scale track. I'm starting on a new track project in the near future and I'd like to use similar construction methods including the track support legs. Could you post some underneath pics of track sections and the method used to join track sections please ? Also it looks like you have used 9mm mdf for the fences. Is this for structural purposes ? Edited by lenny broke, 21 November 2012 - 03:09 PM. Looking good Garry , you have been busy. Wow.. I like it Gary. looks like our Birkdale Racing Team is almost legitimised.. I'll have to build you a trophy showcase so we can get our winning Pink Pig Challenge Trophy from where its been "resting" at Jan's. Nice track Gary not too different to a track in South Africa that I used for inspiration for my track. As is always the case the space is never big enough & had to modify it keep the bride a little bit happy & leave room for the family car & of course all my man shed toys. Here's a pic of the South African track I think it was called Monte Carlo or something like that,maybe Jan is familiar with it. Certainly looks like a quick track Gary, with a couple of corners and esses to keep it sane, Nice. i am with you stoo, 4 lanes just isnt enough. more lanes more excitement and the greater the challenge. I thought you guys would like 4 lanes... 4th sounds better than 6th. Legs are 16mm MDF with the bottom half slotted vertically and the top half horizontally. This gives a good range of adjustment and the bottoms can always be shortened. The joins are just butted up on the crossmembers and bolted together. I don't bother with tongue and groove or other permanent alignment methods, if the track is permanent, or semi permanent, I just put a few screws in the join once I'm happy with the alignment. The sides are 9mm total. I screw and glue a 6mm side then glue a 3mm piece over the 6mm. This gives adequate strength for a 4 lane track and gives a smooth finish (no screw holes to fill). Edited by Garry J, 26 November 2012 - 09:10 AM. Yes, that was the original Monte Carlo's Track. It has been made longer and the drivers stand is at the top end (to the right of your picture) - big problem, the hairpin and the semi hairpin S -bend are both a long way away and very difficult to judge. That track would have worked better if they had kept it original, as per your photo, with the drivers along the main straight. Anyway, still hold the lap record on the 'new' version in 1/24th CanAm LM Sports cars - back in 2007 at a 9 hour enduro. Very nice, I like it - obviously well thought out and workmanship to match. You should be able to marshal with four guys easily. Edited by Springbok Racer, 28 November 2012 - 02:08 PM. Edited by axman, 21 September 2013 - 06:40 PM. Had my first run on Garry's track last night... Wow it is fantastic and a great addition to the tracks available to us in Brisbane . Garry has done a brilliant job setting up his shed as well it's just an alround great facility. Great job Garry . Great to see Birkdale finally up and running.. Garry's fast as a trackbuilder.. but slow as a shed builder ( mind you, the shed lookd like sh*t before) Garry spent a lot of time getting the place almost hermetically sealed with insulated ceilings, door seals and carpet underfoot to keep the dust levels down. The place looks really sharp .. well done Garry.. especially the track. 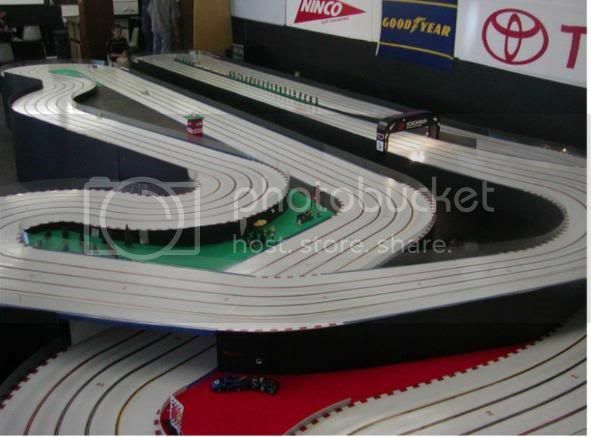 It's one of Garry's modular tracks that at first looks slow but is deceptively fast with the 1/24th Scaleauto's quickly getting lap times down into the mid to low 6's. Later in the night as the traction came up with decent rubber trails Noel B driving my Red Roo LMP posted the (very new) new lap record time of 5.788. The Mini Z's also liked the track with Paul the Texan and Nerangba racers Andrew and Simon putting in some close racing. I'm looking forward to the first "official" race next month with an *open* Group C Mini Z Enduro. Already teams from each of the Brisbane track have expressed interest... will keep you posted. Edited by axman, 07 February 2014 - 02:01 PM.